Light streams through high windows, illuminating a young girl in front of a piano on a stage while a woman stands by, probably her instructor. There is no congregation, but the large lettering on the wall reminds her she is being observed. A three hundred acre plot on the coast of Northport became the site of the Wesleyan Camp Ground at Bayside in 1849. Over several decades, many Society cottages were built, most with gingerbread trim, as well as a steamboat wharf where the Boston boat could land on its way to and from Bangor. In 1891, this auditorium was constructed which could seat 1000 people. It was used for worship services and Chautauqua assemblies as well as lectures, concerts, musicals, dances, and even social gatherings. Many spiritual and religious groups established campgrounds and communities in various spots in Maine in the latter half of the 19th century. This striking image never fails to elicit a response from its viewers. The windows with blinding light pouring through them look like they could be the gates to heaven. The figures themselves seem aglow, and the whole scene has a dreamlike quality. 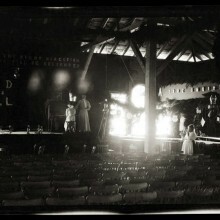 This auditorium was razed in 1934, and though it had been the community center for 40 years, there were no known photographs of its interior until this was rediscovered in the Eastern Illustrating Collection.